A subtle principle that allows you to guess the colors of the spots hidden under three borrowed coins. Print yourself the provided picture and you are immediately ready to perform. From Holland comes this superb close up mental magic miracle invented by one of the cleverest magical inventors, Armandi. You show a square sheet of paper on which is printed a triangle with a surrounding ring. At the points of the triangle are different colored spots. Give the sheet to a spectator and turn your back. Instruct him to put the paper on the table with the picture face up. With the square lying on the table, you ask a spectator (or three if you wish) to take out three different coins (for example, a dollar, an half dollar and a quarter). These have to be placed on top of any of the colored spots by the spectator himself. This is done whilst your back is facing the audience. 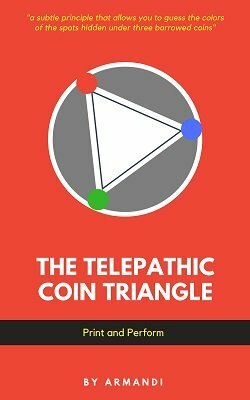 You are immediately able to announce which colors are beneath which coins. It can be repeated over and over again. Printing the provided picture you are immediately ready to perform this clever mental effect. 1st edition 1989, PDF 2 pages.